03.05.1890, 100 Shares of Common Stock á US-$ 100, #32, 20,8 x 30,5 cm, schwarz, grün, Zugvignette. 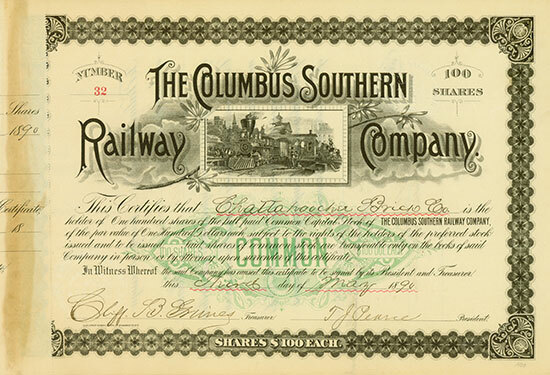 3 May 1890, 100 Shares of Common Stock á US-$ 100, #32, 20.8 x 30.5 cm, black, green, vignette with train. Die 1887 gegründete Gesellschaft betrieb die 88 Meilen lange Bahnstrecke von Columbus nach Albany in Georgia. The company was incorporated in 1887. It operated 88 miles of railway track between Columbus and Albany in Georgia.